The Fedora Cloud image is available for download from your favorite local mirror or directly from Fedora’s servers. In this post, I’ll show you how to import this image into an OpenStack environment and begin testing Fedora 24 Beta. One last thing: this is beta software. It has been reliable for me so far, but your experience may vary. I would recommend waiting for the final release before deploying any mission critical applications on it. 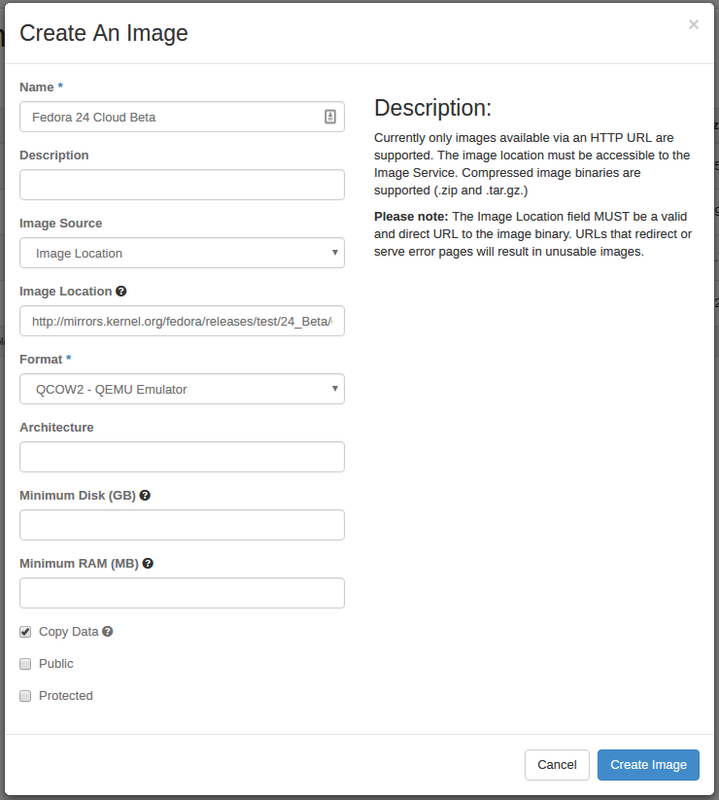 The older glance client (version 1) allows you to import an image from a URL that is reachable from your OpenStack environment. This is helpful since my OpenStack cloud has a much faster connection to the internet (1 Gbps) than my home does (~ 20 mbps upload speed). However, the functionality to import from a URL was removed in version 2 of the glance client. The OpenStackClient doesn’t offer the feature either. Getting an older version of glance client installed is challenging. The OpenStack requirements file for the liberty release leaves the version of glance client without a maximum version cap and it’s difficult to get all of the dependencies in order to make the older glance client work. Let’s use Horizon instead so we can get back to the reason for the post. Click Create Image and the images listing should show Saving for a short period of time. Once it switches to Active, you’re ready to build an instance. Since we’re already in Horizon, we can finish out the build process there. On the image listing page, find the row with the image we just uploaded and click Launch Instance on the right side. A new window will appear. The Image Name drop down should already have the Fedora 24 Beta image selected. From here, just choose an instance name, select a security group and keypair (on the Access & Security tab), and a network (on the Networking tab). Be sure to choose a flavor that has some available storage as well (m1.tiny is not enough). Click Launch and wait for the instance to boot. Once the instance build has finished, you can connect to the instance over ssh as the fedora user. If your security group allows the connection and your keypair was configured correctly, you should be inside your new Fedora 24 Beta instance!